More consumer choices. High-speed, reliable production. World-class KODAK Print quality. 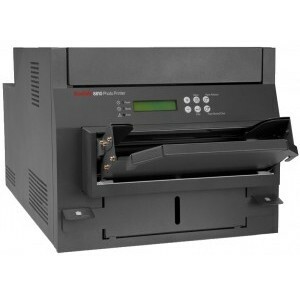 The KODAK 8810 Photo Printer is one smart choice to help boost your bottom line. The Kodak 8810 printer is incredibly flexible and nimble. It’s designed to work with our award winning Kodak Picture Kiosk portfolio and the new Kodak Adaptive Picture Exchange (APEX). It’s ideal for higher volume opportunities. The Kodak 8810 printer is the reliable workhorse of 8X prints in Kodak Kiosks. Kodak Quality Prints that last -Rich, vibrant colors for simply stunning results. KODAK PERFECT TOUCH Technology delivers better, brighter pictures consumers really love. KODAK XTRALIFETM Paper for stain resistant and waterproof prints that last a lifetime, under typical home display conditions. Easy & efficient -New Auto-Load System for media on the Kodak 8810 printer saves clerk time and hassle. Simply set the paper roll into the media compartment and close the cover & the printer does the rest. Roll-fed printing means less waste. Faster - The Kodak 8810 printer produces 20x25 cm (8x10 in.) KODAK Quality prints in as little as 39 seconds. Now 12% faster to first print. More consumer choices, less complexity - Technology used in the Kodak 8810 printers lets you deliver both Satin and Gloss finishes for all products -from one smart SKU of media. Less inventory to manage and consumers really appreciate the new options. Growing portfolio of premium products -Create Photo Books, Collages, Calendars, Enlargements, Print Packages, Greeting Cards and more! More selling time -High capacity rolls for less staff interruption. Useing the Kodad 8810 printer you can make 300 20x25 cm (8x10 in.) or 250 20x30 cm (8x12 in.) prints per roll. Also includes built-in cutter. New creative options -Fresh new border and background designs plus a wide variety of print package layouts now available. Greener Prints - The Kodak 8810 printer requires no chemical processing, no water, instant dry that requires less energy. The solution savvy consumers are seeking today. Compatible with KODAK Picture Kiosk portfolio and our integrated dry lab solution, the KODAK Adaptive Picture Exchange (APEX). Software is not included with your printer shipment, and should be ordered separately. Space requirements: 4 in. space on all sides for optimal performance. P.F.S. is an Authorized Dealer for the most popular professional printers available on the market like Kodak, DNP, Mitsubishi, Sinfonia, HiTi and backs them up with a knowledgeable staff to help you find the perfect printer, weather you need a Photo Booth Printer, Portable Event Printer, Photo Kiosk or if you have any other instant printing need.